James Holmes had social anxiety and homicidal thoughts, which became increasingly delusional when he was prescribed the SSRI antidepressant sertraline. 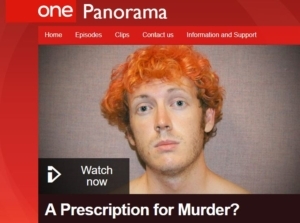 James suddenly stopped taking the medication some weeks before he murdered 12 people and injured 70 others by shooting at the cinema in Colorado. The programme asks if his taking sertraline and its subsequent sudden withdrawal precipitated his psychotic break and the mass killings. Professor David Healy from the UK said, “I believe if he hadn’t taken the sertraline he wouldn’t have murdered anyone.”, while court psychiatrist Dr William Reid who interviewed Holmes before the trial said he thought the killings were a result of mental illness and “completely unrelated to the medication.” Clearly, opinion differs in this case and the defence counsel thought the jury would not accept the argument of diminished responsibility due to the effect of taking sertraline, and instead went for diminished responsibility due to mental illness. While, in this case, the judge did not rule on whether SSRIs played a part, there are other cases where the judgement has implicated SSRIs. After a Winnpieg teenager stabbed his friend to death in 2009, the judge ruled “his mental deterioration and resulting violence would not have taken place without exposure to Prozac”. This year a judge threw out a challenge to the scientific evidence that SSRIs cause suicide, affirming an award of $1.4 million to the survivors of a basketball coach Joseph Mazella, who stabbed himself to death while taking paroxetine (an SSRI) and olanzapine (an antispsychotic). 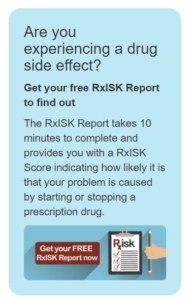 Even before the programme had been broadcast it started attracting criticism as SSRI users rushed to attack the programme on Twitter. After broadcast Sophie Davies, writing in the Huffington Post, complained the programme “served to perpetuate the ignorant societal stereotype that people suffering from mental illnesses are abnormal, violent and dangerous” and urged SSRI users to “not feel ashamed about a successful treatment option”. However, there is another stereotype that needs addressing: that there are people who are mentally ill who need medicating and the rest of the population are normal. In my opinion there is a spectrum of mental disturbance and any of us can be anywhere along that spectrum at any one time. While medication can help some people, clearly others are driven further along the spectrum toward psychosis. What is the frequency of psychosis and violence, including homicide and suicide in patients taking SSRI antidepressants? 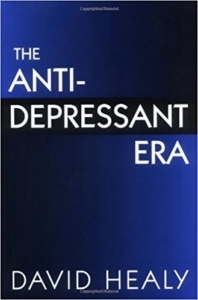 Reviewing the literature, Dr Peter Breggin concluded, “The newer antidepressants frequently cause suicide, violence, and manic-like symptoms of activation or overstimulation”. But how frequently? Professor David Healy estimated the risk of antidepressant-induced psychosis as 1 in 200. 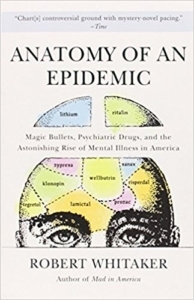 With 64 million antidepressants prescribed in 2016, that could have led to 320,00 incidents of drug-induced psychosis (for a harrowing account of a film director’s rapid descent into psychosis within hours of taking the SSRI escitalopram, see The Pill that Steals Lives by Katinka Blackform Newman). It has to be said that only a minority of psychotic patients become violent. A study of 850,00 individuals in Sweden taking SSRIs found no association with violent crime for over 25s and a positive association for those under 25. There is scope for more research independent of the drug companies to identify the risks of taking SSRI and other psychotropic medications. Are antidepressants being overprescribed? The NICE Guidelines for treating depression say, “Do not use antidepressants routinely to treat persistent subthreshold depressive symptoms or mild depression because the risk–benefit ratio is poor”. It would be interesting to see how many of the 64 million UK prescriptions for depression are for subthreshold or mild depression. The risks of antidepressants also have to be see in the context of differing opinions on the efficacy of antidepressants within the medical profession, hence the debate at the Maudsley Institute of Psychiatry entitled, Does Long-Term Use of Psychiatric Medications Do More Harm Than Good? Are the risks of taking antidepressants being correctly evaluated and communicated? With so much mis-information from pharmaceutical companies it would not be surprising if GPs are not fully aware of the risks of taking antidepressant medications. Anecdotal evidence would suggest doctors rarely inform patients of the potential side-effects so they can make an informed decision on whether to take a medication or not. When patients do report side-effects, they are often discounted as due to the presenting condition rather than the medication. This happened to me when a psychiatrist prescribed venlafaxine for me in the USA. I developed akathisia – a tormenting restlessness that led me to pace up and down all day and a common side-effect of SSRIs – but the psychiatrist just said, “keep taking the medicine”. Are there sufficient non-pharmaceutical therapies available? Clients who contact my private practice have usually been offered or prescribed medication but told there is a waiting list for psychological therapy. Jeremy Hunt’s announcement on 31 January 2017 that £1bn would be spent on recruiting mental health professionals, including therapists is to be welcomed in this regard. Is there a stigma attached to talking therapies? The pharmaceutical companies have done a great job, despite a paucity of evidence, that mental illness is caused by chemical imbalances that can be rectified by medication and many people see no stigma in taking antidepressants. While attitudes to seeing a counsellor or psychotherapist have improved, with 28% of people in the UK consulting a counsellor or psychotherapist in 2014, greater openness to the talking therapies at an early stage might reduce the number of antidepressant prescriptions. Many of my clients would not admit to their friends or colleagues that they are seeing a counsellor, despite the benefit they attribute to the therapy. In response to the Panorama programme, Stephen Buckley, Head of Information at Mind said, ““Millions of people take SSRIs and other antidepressants and many find them useful in managing their mental health problems. Side effects from medication can be serious but it’s important to recognise that severe side effects such as those explored in this programme are incredibly rare. Anyone prescribed medication for a mental health problem should be fully informed about the drug and its side effects so they can make an informed choice about whether it’s the right treatment for them.”. I agree with the above statement apart from the statement that the incidence of severe side-effects is “incredibly rare”. Such a statement needs to be based on reliable, independent research and I don’t believe we have the data to support this assertion at present. There also needs to be adequate support for those who choose not to take medication and those who wish to discontinue it. Many psychotropic medications have severe withdrawal symptoms and discontinuation needs to be done under medical supervision. None of the above should be construed as medical advice. If you are concerned about your medication, please consult your medical professional. Dennis Richards is a counsellor, psychotherapist and hypnotherapist. He is the Director of Rodney Street Therapies. http://www.mythsandrisks.info A website about mental health myths, treatment risks and alternatives by UK existential therapist Mick Bramham. The Critical Psychiatry Network is a forum for critical thinking about alternative approaches to psychiatry. https://beyondmeds.com/ Alternative approaches to and politics of mental health. 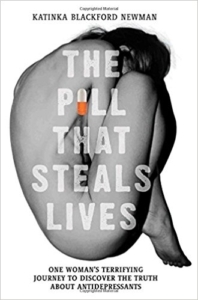 The Pill That Steals Lives a not for profit organisation that publicises the dangerous side effects of SSRI antidepressants founded by documentary film maker Katinka Blackford Newman. 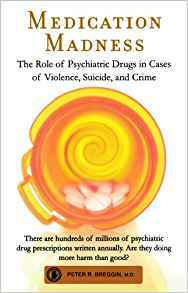 Psychiatric Drug Facts the website of Dr Peter Breggin, a Harvard-trained psychiatrist and former Consultant at NIMH who has been an expert witness in many drug-related trials.